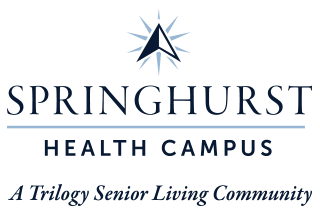 At Springhurst Health Campus, we’ve designed every aspect of our campus to meet your unique needs - that includes our floor plans. In our single-story Independent Living villas, it’s easy to imagine countless ways to arrange your favorite furniture and art. Our Assisted Living and Skilled Nursing suites are also yours to decorate, and include features that will keep you feeling cozy, settled, and right at home. In our Memory Care neighborhood, the floor plan of each suite, as well as the areas surrounding it, support the needs of those with memory loss. Whatever area of our campus you choose to call home, you’ll be within arm’s reach of delicious food, a wealth of activities, and of course, compassionate care. Schedule a tour to see it in person!